Unlike tomatoes, peppers and other heat-loving garden favorites, peas are so cold-hardy and tough that most gardeners never need to start them indoors. Usually. It’s come to this. I am starting pea seedlings indoors, on the dining room table. Peas. I can’t quite believe I am doing this. I start all sorts of seedlings indoors. Tomatoes and peppers? Sure. Eggplants and basil and sweet potatoes? Absolutely. But peas? Who starts peas indoors? Well, me, apparently. The slugs made me do it. If you’ve already explored the site a bit, then you know that the outlaw garden is a relatively young garden (and if you haven’t explored, click here the read the whole story). A year ago, this garden was still front lawn. Now, it’s a rule-breaking vegetable garden. That transformation from lawn to garden took a lot of time. And sweat. And mulch. It’s the mulch that the slugs like. I’m a big believer in letting nature do its work in the garden, whenever possible. The wasps control my cabbage worms. The ladybugs prowl for aphids. And, the worms do my tilling. But, those worms are picky about their working conditions. They like cool and moist soil, and they insist on a steady diet of leaves and other plant matter. Mulch. Worms love mulch. Well, they love mulch-covered soil. And, since mulch is also a great way to control weeds (or, grass, if you’re transforming a lawn to a garden), I used a lot of mulch. (Note: For those who are curious, I put down a thick layer of newspaper before I mulched. Otherwise, a lot of that grass would have pushed through to daylight). So, the worms are happy. And, the plants are happy. But, unfortunately, the slugs are also happy. And, hungry. The slugs are very, very hungry, and they seem to LOVE the taste of just-about-to-sprout pea seeds. The long-term solution here is obvious: less mulch. Spreading diatomaceous earth around will help a lot, too. But, those are both long-term solutions. And, the absence of peas in my spring garden is a very short-term problem. I don’t have time for long-term. I need something that will work immediately. So, for the very first time, I’m starting my peas indoors. The plan is to sprout the peas inside, and then transplant them into the garden when they have a few sets of leaves. I’m hoping that head-start will give the seedlings a fighting chance against the slugs. I’ll also coat each seedling with diatomaceous earth, just for good measure. 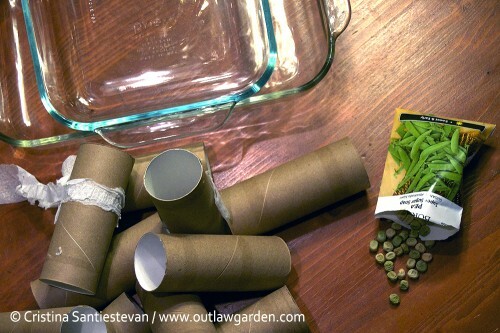 Toilet paper tubes, a casserole dish and seeds. That's just about all you'll need to start peas (or any seeds) indoors. 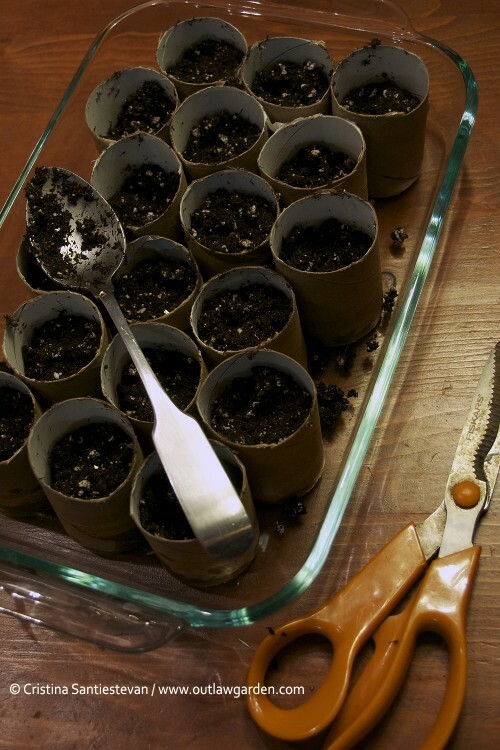 You will need soil, toilet paper tubes, a pair of scissors, a waterproof container (I used a casserole dish) and some potting soil. Also, seeds, water and something to scoop the soil. Such as, perhaps, a tablespoon, which should be very convenient if you’re doing this on your dining room table too. Oh, and you’ll want something to label the tubes with, if you’re starting more than one kind of pea (I just had ‘Super Sugar Snap’ peas on hand, so…). No need for a bottom on these pots. 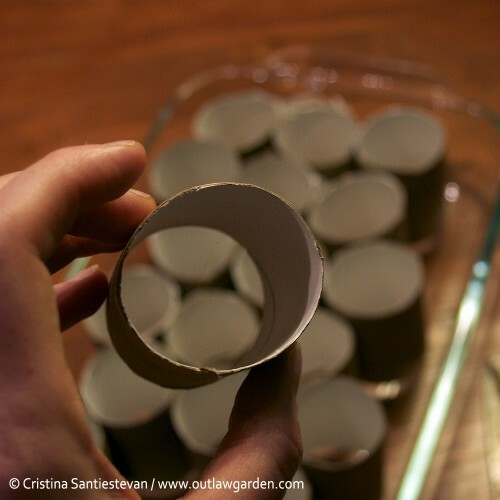 Just cut the cardboard tubes in half, and set them in place in the casserole dish. Grab your scissors and cut each tube in half. 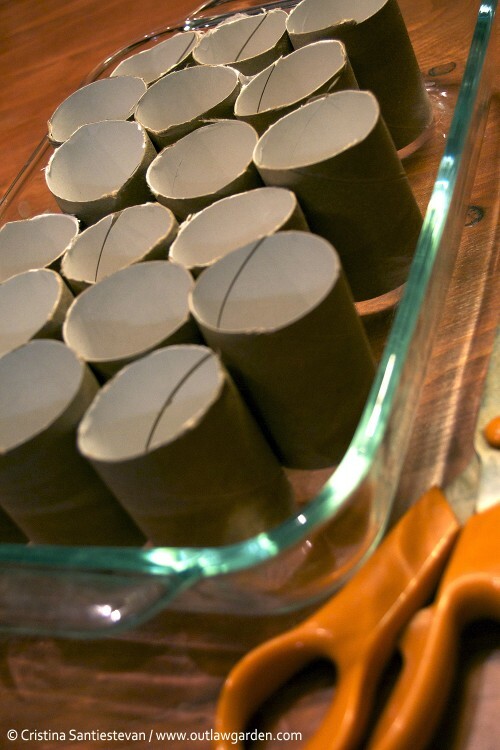 Set each tube into your waterproof container, with the cut side up. That’s because the cut side is probably going to be a bit uneven, and you don’t want the soil to dribble out. Oh, and no need for bottoms on these pots. We want the peas’ roots to be free to explore when we transplant them! New discovery: My casserole dish holds 18 toilet paper tube halves. Ok. So, once you’ve got your soil nice and moist (go for that classic cake-crumb consistency), just grab your scoop and start filling those pots. I used a tablespoon, and it was PERFECT. Two not-quite-heaping spoonfuls filled each tube to 2/3 full when the soil was firmly pressed into the tube. This left the perfect amount of space for the seeds. Let's all just agree that tablespoons are the perfect mini garden trowel. Side note: Am I the only one who spent her childhood digging up the yard with tablespoons? Seriously, these things are the perfect digging implement for tiny hands. Of course, I never remembered to bring the spoons back inside when I was done. I must have lost dozens and dozens of spoons in the yard and woods around my childhood home. If some future archaeologists ever tackle a dig at my folks’ house, they may assume they’ve found the site of a spoon factory. 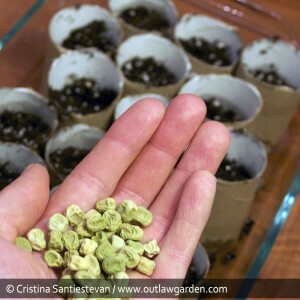 Starting peas indoors is a great way to get a jump on the gardening season and avoid the risk of hungry hungry slugs. This would also be a great activity for young children, because the seeds are big and easy to handle, and the seedlings sprout in just a few days. I planted 2-3 peas in each tube, because that’s how many peas were left in the packet. Peas are a fairly forgiving plant, so I’m not too worried about over-crowding. Besides, I’ll probably set each tube about six to eight inches apart in the garden. That’s plenty of space for a couple pea plants. 5. Cover them up, and give them a drink. 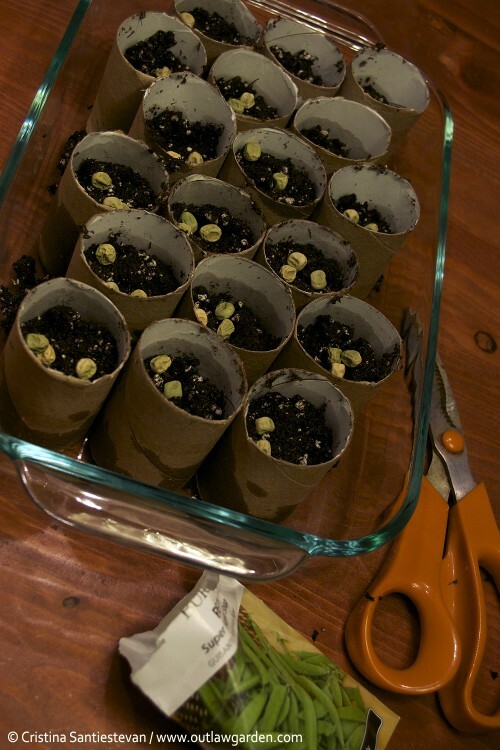 Another tablespoon of soil will fill those tubes up to the top, covering each pea with about an inch of soil. Again, you’ll want to push that soil down with your fingers, just until everything is nice and firm. And, that’s it. Add some water to the container, and you’re done. Unless these slugs are really persistent (and know how to pick locks and climb dining room tables), those peas should be sprouting in about three to four days. Just keep the soil moist, and the seeds will do the rest. Have you ever started peas indoors? How’d it go? I have awarded you a Versatile Blogger award. Head over to my blog to check it out! Thanks for sharing that post! Interesting stuff. I’ve had good luck with diatomaceous earth in the past, but that doesn’t mean it will work for everyone (or, that it will work *this year* for me). That seems to be how it goes with these garden pests. Some solutions work for some gardeners, and other solutions work for others. Only thing we can do is continue to experiment — like you did — and try to figure out what works for our own gardens. My computer reports this link as going to an “attack page” Did anyone else check it? If the author is not aware of this he/she might want to check what is causing this. I have tons of snails, and they love the garden as much as I do. I buy Cayenne pepper by the pound and spinkle it around my plants as soon as I see a trail on the patio. I have to do it every two weeks or so, but so far the snails and the ear wigs seem to leave my tender seedlings alone. I also have cockroaches where I live, and use the cheapest baking soda I can find for a bug deterrent. I believe I read somewhere it even kills them. 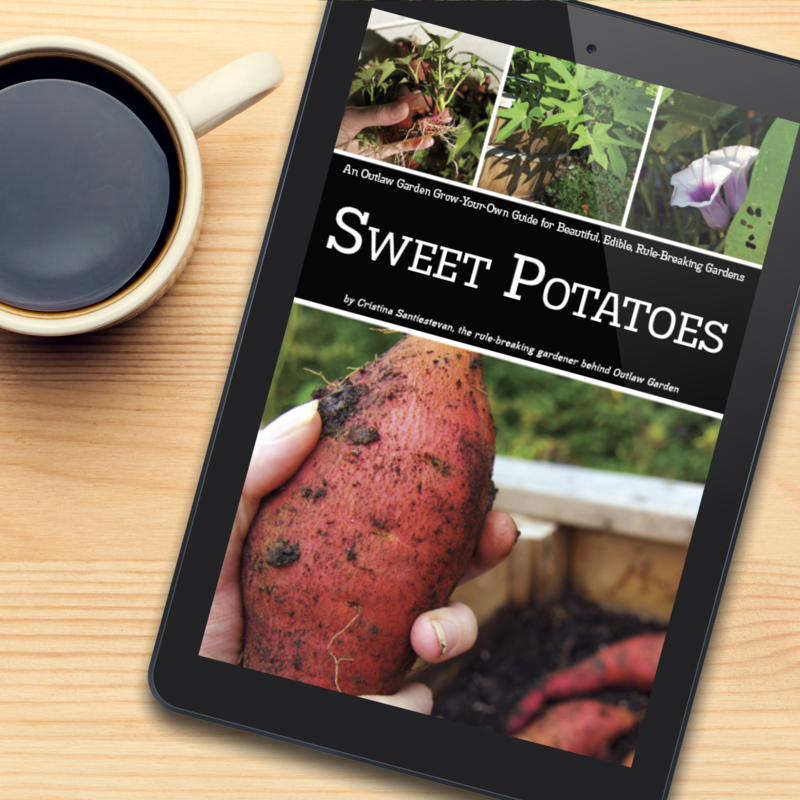 I love organic gardening and your web site. Thank you for pleasant photo’s and great information. Beer. Slugs and snails love beer. They crawl right into pans of the stuff and drown. And, since molluscuae aren’t picky about their brand, any beer will do – oxidized or skunked stuff that the distributor is selling cheap, cheapo generic stuff that not even a frat boy would drink, or bad homebrew works just fine. On the other hand, you can also use good beer diluted by 50% and drink the rest yourself. I’ve had very good luck controlling slugs in my garden by burying empty catfood cans (but any small sized container will do) so the soil just comes to the lip of the can. Place one can every 3 feet or so. Fill each can halfway full of beer and leave overnight. Dump the dead slugs and beer into the garden as an impromptu side dressing or as bird food. Obviously, this trick works best on warm, clear nights when slugs and snails are active but there is no rain to dilute the beer. I started pease indoors this year for another reason, I was late to plant. I just used a nursery type flat with soft slit plastic on the bottom and used only perlite loosely packed. From 100 seeds I got 97 germinated within 4 day and almost all had a tap root an inch long and not yet first leaf pair open, just the emerging hooked stem. I pushed the perlite up from the bottom and about 1/2 inch out tenderly and just removed the seedlings gently by grasping the uppermost portion of the root just below the seed. It is very fragile at the seed and you will lose plants transplanting if anything happens there. Anyway the perlite fell away and I had nice braning off the tap root and I immediately sowed them in the garden, without removing any perlite clinging in the new developing root branches. After a half day virtually all the cases the plants are looking good. Hopefully I’ll be ok and the slug army won’t come. I’m starting the garden with them so the mulch will come when the pease are about the size you mentioned. Why disrupt the whole container/root thing when transplanting? Why not just pop the tube into the poil? It will decompose anyhow and maybe be a deterrant for cutworms if above the ground.